The Pareswar Temple, the Siddheswar temple and the Lokanath temple in Paradipgarh are the old important temples in the PDA area in the old kingdom of Kujang. As legend says, the great Parasar muni (muni means saint) had selected this place as his yoga sthali (place of yoga). He started his yoga in the place, where the Pareswar temple is situated now and had achieved siddhi, where the Siddheswar temple is situated now. In both these temples, the deity Shiva is being worshipped. Loknath Temple The other temple, that is, the Lord Lokanath temple is famous for the legend that Mahapurush Vyasadev had attained nirvan here. The unique feature of this Lokanath temple is the typical shape in the construction of temple in an elephant shape. In this temple, a 6-feet high image of Vyasadev is being worshipped and accordingly the area is called as Vyasakhetra. Udayabata Dham Another attraction of this place is the Udayabata Dham at a distance of about 52 kms from Jagatsinghpur and 84 kms from Cuttack with an ashram in it. It is a good picnic spot for the locals as well as the visitors. There are a number of festivals that take place in this place round the year. 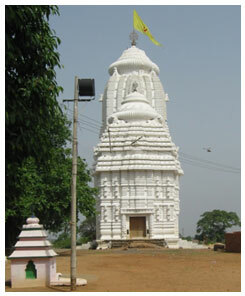 Garoi Famous for the holy seat of Lord Jagannath, Lord Balabhadra and Devi Subhadra, Garoi is situated near Kujang at a distance of about 35 kms from the district headquarters Jagatsinghpur. The temple, constructed with Orissan art and architecture, is 105 feet high. There is a Laxmi temple by its side with a beautiful standing idol of Goddess Laxmi. Lord Jagannath is seated in padmasan with sankha and chakra ayudhas, Lord Balabhadra is seated with Saptapheni in hands and legs, Goddess Subhadra is seated here with lotus in hands. The place is usually known as Purushottam Kshetra. Situated at around 14 kms from Kujang, 54 kms from Jagatsinghpur and 34 kms from Paradip, Garhkujang is famous for its deity Kunjabihari. This village had the garh or fort of Sandha Raja of Kujang, and hence the name Garhkujang. The garh is ruined now and the remains of the garh stones are witness to the past. Lord Kunjabihari is being worshipped here in form of Lord Jagannath with elder brother Balabhadra and younger sister Subhadra. The place is usually called as Subhadrakshetra after the name of Subhadra. Legend has it that a devotee of Lord Jagannath, Iswar Mohanty by name, took the brahmah of Jagannath, Balabhadra and Subhadra from Puri at the time of destruction of the Lord Jagannath temple by Kalapahad. He worshipped the brahmah first at Mahavir Ashram on the banks of Jatadhari River around 2 kms away from this village. Subsequently, the Sandharaja came to know of this in his dreams and placed the bigrahas in this temple. During that time, the place was surrounded by kunja bana and accordingly, the deity came to be known as Kunjabihari.